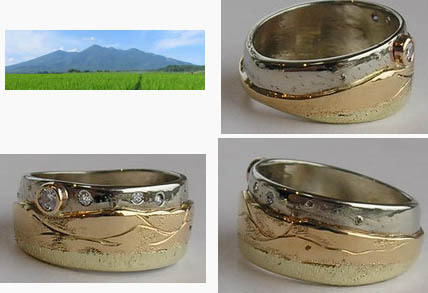 By applying different golds, silver or platinum into the design the mountains now become distinguish and unique. 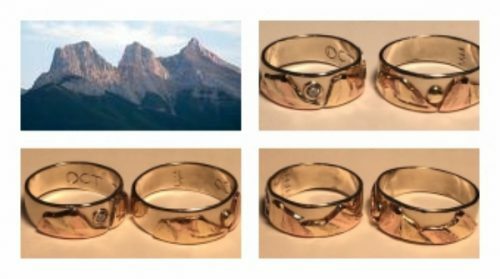 These one-of-a-kind type of mountain ranges represent Virtual or actual ranges for the Customer. 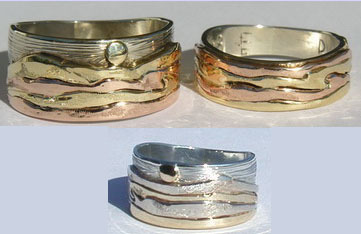 Created in rose gold, yellow gold, silver, green gold, or platinum. 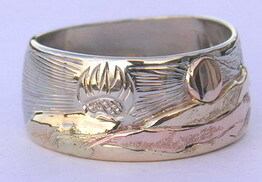 For example, the Gila Forest below has 14k Rose gold tops, on yellow gold base and white gold sands and a silver base. 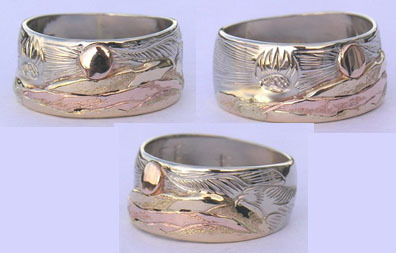 MnRMM5a– Rose and yellow gold on white gold base, rose gold sun. 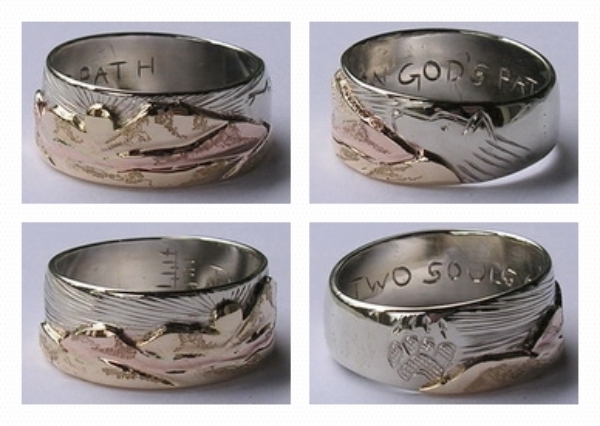 These Medicine Mountain rings are alternating rose and yellow golds. The 2 gold plates are stacked on top of each other and cut, and then put back together with switching each 2nd strip. 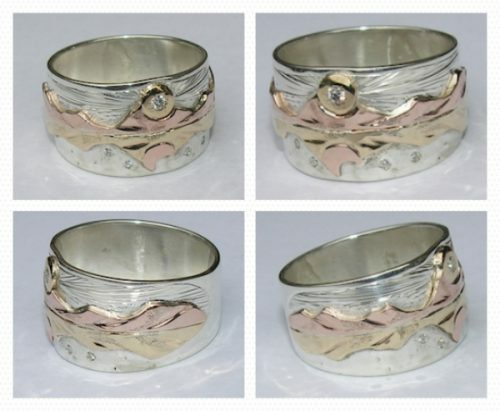 They produce 2 completely opposite material layouts…one with rose yellow rose etc…and the other with yellow rose yellow, et c… A perfect pair of matching and alternating rings for a wedding set. 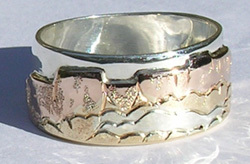 The MnRAp24 ( above ) is a great example of multiple metals and stones to create a scene. 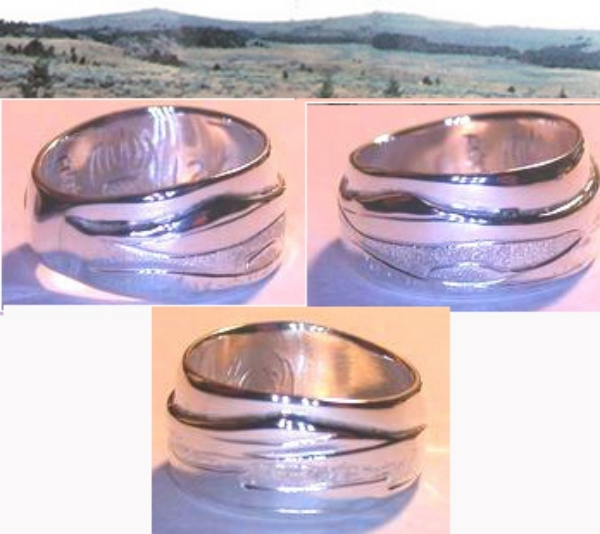 It has identical reversed mountains on each half ( top and bottom ) . 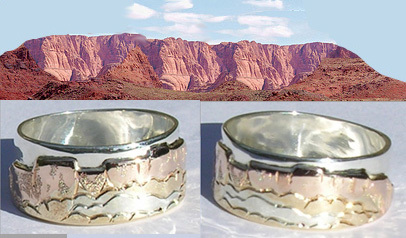 The top mountains are Rose gold and the bottom are Yellow gold. 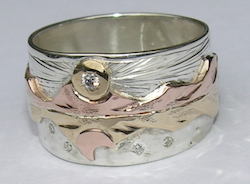 The top has a sun and sun-burst rays with a diamond sun….. 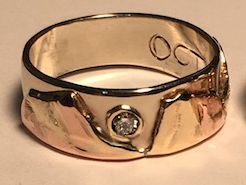 The bottom has the rose gold moon with several smaller diamond stars.